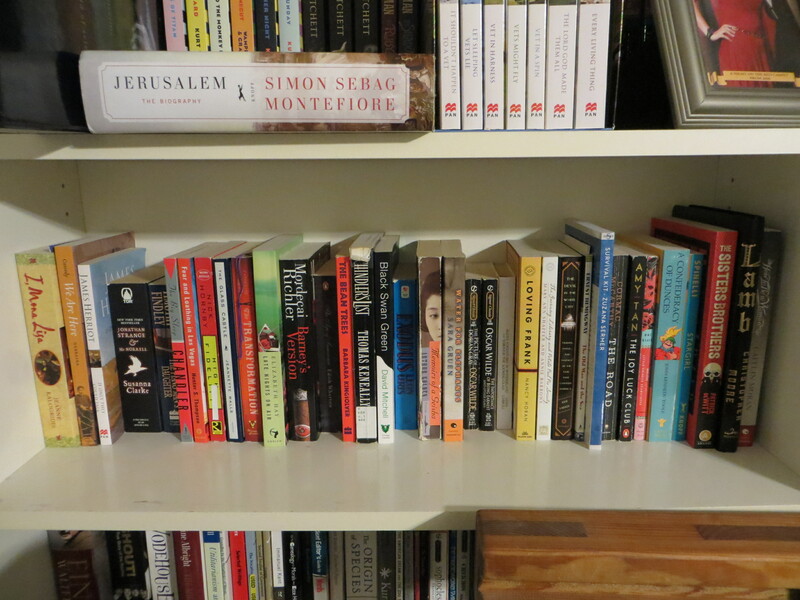 100 things to do in 1000 days UPDATE; #62: Read one bookshelf’s worth of my unread books. Just a quickie update on #62 (just in case you didn’t read the title): I have now finished half the books, and it’s not even June yet. Hurray! Unfortunately, it seems I have finished shorter and/or smaller books, because the damned shelf still looks more than half full. Ah well. Currently, I am in the middle of Kurt Vonnegut’s Sirens of Titan. 100 things to do in 1000 days IN PROGRESS; #62: Read one bookshelf’s worth of my unread books. I have a lot of books. A lot. It’s not only that I buy six books every time I go into a Chapters or Costco, or that it’s everyone’s go-to present for me for birthdays and holidays, or that I used to work at a bookstore and abuse my employee discount. When my high school library gave away the books they didn’t want anymore, I took in the refugees. When I worked for that bookstore, and people dropped off paperbacks they didn’t want, I cared for the orphans. My last job provided me with copies of all 20 memoirs they’d published so far. And when anyone I know is cleaning out their book stock, I’m usually there within minutes. Also, I never throw anything away. So when I say I have a lot of books, I do mean a lot. Many of which I have never read. The problem is that it takes a lot less time to buy books then it does to read them, so that damned To Read pile is always growing exponentially faster than the Read pile. But there is no point in owning a bunch of books you’re never going to read. I certainly meant to read them when I bought (or otherwise obtained) them. So one of the items on The List is to read one bookshelf’s worth of my unread books – put all the unread books that will fit onto one shelf in one place, and make my way through them. This will absolutely not include new books bought between now and the completion of that shelf, but I may substitute a book here or there, if I’m not enjoying it, or it’s a particularly slow read (hey, I’m on a deadline here; “finish all books I’m currently in the middle of” is on the next list). Note: I am only starting this item now, because “complete a Cannonball Read” was also on my list, and I didn’t want books read for that (which could include books borrowed from libraries or friends, books I’d re-read, and books I’d just bought) to count for this item. I have now read 52+ books (although I have yet to review all of them), so I consider the spirit of that item complete. Books read for this item will count toward the 5th CBR, however.